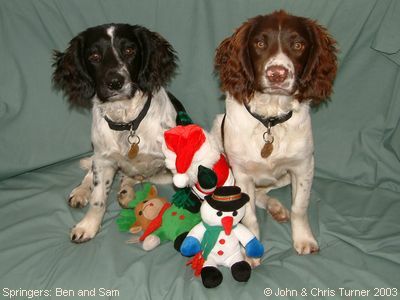 These two spritely fellows are litter-brothers of Kara, born 30 May 2003 at Brian and Sandra Courtman's kennels in Loughborough. This photograph shows them at nearly 6 months old. Their owners John and Chris Turner say they are great fun to be with - “a handful at times but there is never a dull moment” - I bet they are, so I'd say it's a minor miracle they stayed still long enough for this photo to be taken!! Ben is the black and white one, and the more mischievous; Sam is liver and white and a little more sensible!! Other gun-dog puppies are available from time to time from Brian and Sandra Courtman's Kennels in Loughborough, Leicestershire.